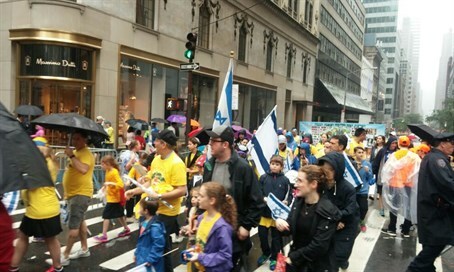 Some of the over 30,000 marchers in NYC Israel Day Parade spoke with Arutz Sheva about what brought them to 5th Ave. in the drizzling rain. Arutz Sheva was on hand in New York City on Sunday as over 30,000 supporters of Israel marched despite the rain in the annual Celebrate Israel Parade. Marchers were unified in their message: "Come rain or shine we stand with Israel."